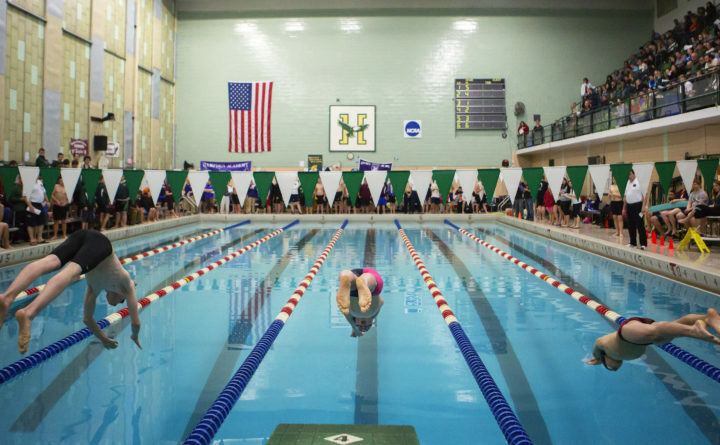 High school swimmers are preparing for upcoming conference and state championship meets. 200 Yard Medley Relay: 1, Hampden ‘A’ (Cameron LaBree, Matthew Vine, Chris Chaffe, Zach Steigert), 1:50.90. 2, Washington Academy ‘A’ (Zain Fitzsimmons, Nick Luuring, Caleb Campbell, Aleks Mitrovic), 1:57.71. 200 Yard Freestyle: 1, Derrick Cunningham, HAMP, 2:30.06. 2, Steven Santiago, HAMP, 2:32.35. 3, Jakob Brown, HAMP, 2:40.59. 4, George Albee, WA, 2:45.19. 5, Steven Albee, WA, 3:01.35. 200 Yard IM: 1, Zach Steigert, HAMP, 2:46.48. 2, Gavin Kearns, HAMP, 2:51.60. 3, Chris Chaffe, HAMP, 2:53.85. 4, Isaac Atkinson, WA, 3:03.70. 5, Bach Phung, WA, 3:14.85. 50 Yard Freestyle: 1, Cameron LaBree, HAMP, 23.17. 2, Aleks Mitrovic, WA, 25.55. 3, Matthew Vine, HAMP, 26.45. 4, Caleb Campbell, WA, 27.74. 5, Johnny Hanson, HAMP, 31.54. 6, Dominic Brown, WA, 32.48. 100 Yard Butterfly: 1, Zain Fitzsimmons, WA, 59.50. 2, Jakob Archer, HAMP, 1:13.70. 3, Bach Phung, WA, 1:39.14. 500 Yard Freestyle: 1, Cameron LaBree, HAMP, 5:27.32. 2, Anthony Hall, HAMP, 6:41.78. 3, Steven Santiago, HAMP, 7:02.02. 200 Yard Freestyle Relay: 1, Washington Academy ‘A’ (Zain Fitzsimmons, Caleb Campbell, Nick Luuring, Aleks Mitrovic), 1:49.43. 2, Hampden ‘A’ (Gavin Kearns, Derrick Cunningham, Steven Santiago, Jakob Archer), 1:58.23. 3, Hampden ‘B’ (Johnny Hanson, Anthony Hall, Jakob Brown, Jaden Peterson), 2:09.08. 4, Washington Academy ‘B’ (George Albee, Dominic Brown, Steven Albee, Isaac Atkinson), 2:16.45. 100 Yard Backstroke: 1, Zain Fitzsimmons, WA, 59.20. 2, Derrick Cunningham, HAMP, 1:22.77. 3, Isaac Atkinson, WA, 1:28.04. 4, Jakob Brown, HAMP, 1:29.56. 100 Yard Breaststroke: 1, Jakob Archer, HAMP, 1:19.20. 2, Zach Steigert, HAMP, 1:30.97. 3, Chris Chaffe, HAMP, 1:32.19. 4, Griffin Dedmon, WA, 1:37.81. 400 Yard Freestyle Relay: 1, Hampden ‘A’ (Zach Steigert, Jakob Archer, Chris Chaffe, Cameron LaBree), 4:09.63. 2, Hampden ‘B’ (Gavin Kearns, Anthony Hall, Steven Santiago, Matthew Vine), 4:28.02. 200 Yard Medley Relay: 1, Hampden ‘A’ (Sydney Jordan, Rachel Vine, McKayla Poulin, Mikaela Shayne), 2:23.00. 200 Yard Freestyle: 1, Cara Whitmore, HAMP, 2:24.39. 2, Kaylee Mayo, HAMP, 2:42.59. 3, Claire Nickels, HAMP, 2:51.27. 50 Yard Freestyle: 1, Cara Whitmore, HAMP, 30.10. 2, Mikaela Shayne, HAMP, 30.52. 3, Julie Llerena, HAMP, 33.50. 4, Vivian Noakes, WA, 40.58. 5, Phoebe Colbeth, WA, 42.83. 6, Ann Tran, WA, 58.45. 100 Yard Butterfly: 1, Rachel Vine, HAMP, 1:22.79. 2, Kaylee Mayo, HAMP, 1:27.32. 100 Yard Freestyle: 1, Kaitlynn Raye, HAMP, 1:15.62. 2, Julie Llerena, HAMP, 1:19.91. 3, Emily Hatch, HAMP, 1:31.91. 4, Ann Tran, WA, 2:12.42. 500 Yard Freestyle: 1, Mikaela Shayne, HAMP, 6:53.22. 2, Phoebe Wagner, HAMP, 7:04.40. 3, Sara Poll, HAMP, 7:05.13. 200 Yard Freestyle Relay: 1, Hampden ‘A’ (Rachel Vine, Kaylee Mayo, Kaitlynn Raye, Cara Whitmore), 2:05.76. 2, Hampden ‘B’ (Claire Nickels, Julie Llerena, Phoebe Wagner, Sara Poll), 2:19.84. 100 Yard Backstroke: 1, Sydney Jordan, HAMP, 1:15.37. 2, McKayla Poulin, HAMP, 1:18.98. 3, Vivian Noakes, WA, 2:09.36. 100 Yard Breaststroke: 1, Emily Hatch, HAMP, 1:51.82. 2, Phoebe Wagner, HAMP, 1:52.96. 3, Phoebe Colbeth, WA, 2:01.25. 400 Yard Freestyle Relay: 1, Hampden ‘A’ (Sydney Jordan, Rachel Vine, Mikaela Shayne, Cara Whitmore), 4:38.13. 2, Hampden ‘B’ (Sara Poll, Kaylee Mayo , Kaitlynn Raye, McKayla Poulin), 5:05.20. 200 Yard Medley Relay: 1, Bangor ‘C’ (Brady Hand, Simon Socolow, Connor Prouty, Fritz Oldenburg), 1:54.21. 2, Bangor ‘B’ (Daniel Adam, Griffin Erb, Carson Prouty, Tate Scovil), 2:01.82. 3, Foxcroft Academy ‘A’ (Triston Green, Hunter Kemp, Noah Contreras, Yao Li), 2:17.24. 200 Yard Freestyle: 1, Simon Socolow, BANG, 2:06.84 2, Brady Hand, BANG, 2:14.87. 200 Yard IM: 1, Joshua Watson, BANG, 2:35.67. 2, Adam Elkadi, BANG, 2:43.78. 50 Yard Freestyle: 1, Noah Contreras, FA, 25.47 2, William Gagnon, BANG, 30.49. 3, Yao Li, FA, 32.15. 4, Jesse Karnes, BANG, 34.49. 5, Ben Reed, BANG, 35.02. 100 Yard Butterfly: 1, Noah Contreras, FA, 1:08.94 . 100 Yard Freestyle: 1, Daniel Adam, BANG, 1:00.69. 2, Tate Scovil, BANG, 1:02.40. 3, Triston Green, FA, 1:04.88. 4, Ben Reed, BANG, 1:21.87. 5, Yao Li, FA, 1:27.89. 500 Yard Freestyle: 1, Griffin Erb, BANG, 5:56.93 2, Brady Hand, BANG, 6:03.71 3, Adam Elkadi, BANG, 6:42.77. 200 Yard Freestyle Relay: 1, Bangor ‘B’ (Daniel Adam, Tate Scovil, William Gagnon, Fritz Oldenburg), 1:52.79. 2, Bangor ‘A’ (Joshua Watson, Simon Socolow, Ben Reed, Jesse Karnes), 1:59.37. 3, Foxcroft Academy ‘A’ (Yao Li, Hunter Kemp, Triston Green, Noah Contreras), 1:59.96. 100 Yard Backstroke: 1, Joshua Watson, BANG, 1:12.43 2, Triston Green, FA, 1:15.84. 3, Hunter Kemp, FA, 1:24.63. 4, William Gagnon, BANG, 1:26.55. 100 Yard Breaststroke: 1, Simon Socolow, BANG, 1:14.23 2, Fritz Oldenburg, BANG, 1:16.22 3, Hunter Kemp, FA, 1:29.12. 4, Jesse Karnes, BANG, 1:37.84. 200 Yard Medley Relay: 1, Bangor ‘A’ (Rachel Hand, Susanna Sellnow, McKayla Kendall, Ginny Hunt), 1:59.84. 2, Bangor ‘B’ (Cadence Stockford, Silvia Davids, Maddie Huerth, Claire Pellegrino), 2:18.03. 200 Yard Freestyle: 1, Rachel Hand, BANG, 2:10.21 2, Ginny Hunt, BANG, 2:13.68 3, Maya Elkadi, BANG, 2:32.05. 200 Yard IM: 1, McKayla Kendall, BANG, 2:23.73 2, Susanna Sellnow, BANG, 2:28.26 3, Kelly Pellegrino, BANG, 2:50.13. 4, Amy Waugh, FA, 3:05.92. 1 mtr Diving: 1, Guilia Fodor, BANG, 95.95. 100 Yard Freestyle: 1, Maddie Huerth, BANG, 1:00.54 2, Claire Pellegrino, BANG, 1:04.63 3, Kelly Pellegrino, BANG, 1:06.58. 500 Yard Freestyle: 1, Silvia Davids, BANG, 6:47.74. 2, Libby Colley, BANG, 7:01.01. 3, Alexa Jarvis, BANG, 7:04.04. 4, Amy Waugh, FA, 7:18.46. 200 Yard Freestyle Relay: 1, Foxcroft Academy ‘A’ (Dayita Durachman, Abigail Henderson, Olivia McCorrison, Amy Waugh), 2:16.78. 2, Bangor ‘B’ (Zoey Gilson, Guilia Fodor, Hailee Vafiados, Katherine Clukey), 2:35.08. 3, Bangor ‘A’ (Alexia Navarro, Vivien Doerper, Sharie Ribleza Mackenzie Morin), 2:42.58. 100 Yard Backstroke: 1, Susanna Sellnow, BANG, 1:09.57 2, Claire Pellegrino, BANG, 1:11.14 3, Libby Colley, BANG, 1:21.88. 4, Reece McCarty, FA, 1:29.36. 100 Yard Breaststroke: 1, Maddie Huerth, BANG, 1:26.49. 2, Olivia McCorrison, FA, 1:28.44. 3, Anya Ganesh, BANG, 1:32.29. 4, Abigail Henderson, FA, 1:40.17. 5, Vivien Doerper, BANG, 1:41.81. 400 Yard Freestyle Relay: 1, Bangor ‘A’ (Rachel Hand, Katherine Clukey, Alexa Jarvis, Maddie Huerth), 4:31.46. 2, Bangor ‘B’ (Kelly Pellegrino, Mackenzie Morin, Silvia Davids, Susanna Sellnow), 4:43.77. 200 Yard Medley Relay: 1, Ellsworth ‘A’ (Clarke, MacPherson, Barry, Nelson), 2:00.27. 2, Old Town ‘A’ (Blackie, Ketch, Ketch, Archer,), 2:07.79. 3, Ellsworth ‘B’ (Stevens, Moseley, Hammer, Mazgaj), 2:16.77. 4, Old Town ‘B’ (Kenny, Trefts, Diaz, McPhee), 2:28.95. 200 Yard Freestyle: 1, Clarke, Ellie, ELLS, 2:12.85. 2, Moseley, Kristen, ELLS, 2:22.84. 3, Saucier, Mackenzie, OT, 2:31.40. 4, Trefts, Izzy, OT, 2:43.75. 5, Sossong, Brooke, OT, 2:50.37. 200 Yard IM: 1, Barry, Kristy, ELLS, 2:19.60. 2, MacPherson, Caitlin, ELLS, 2:34.07. 3, Kenny, Mikaela, OT, 3:04.53. 4, 1-4-5 Trefts, Libby, OT, 3:09.35. 5, Talcove, Hannah, OT, 3:19.45. 50 Yard Freestyle: 1, Barry, Kristy, ELLS, 26.74. 2, Ketch, Abby, OT, 28.20. 3, Archer, Cathryn, OT, 29.62. 4, Mazgaj, Abby, ELLS, 30.07. 5, Diaz, Kendra, OT, 30.21. 6, Atwater, Marissa, ELLS, 32.67. 100 Yard Butterfly: 1, Ketch, Emily, OT, 1:07.69. 2, 1-2-4 MacPherson, Caitlin, ELLS, 1:12.46. 3, Blackie, Teagan, OT, 1:12.75. 4, Frank, Lillian P, ELLS, 1:16.12. 5, Diaz, Kendra, OT, 1:29.80. 100 Yard Freestyle: 1, Nelson, Miriam, ELLS, 1:00.84. 2, Ketch, Abby, OT, 1:02.60. 3, Archer, Cathryn, OT, 1:07.21. 4, Saucier, Mackenzie, OT, 1:07.68. 5, Hanson, Lilja, ELLS, 1:09.70. 6, Atwater, Marissa, ELLS, 1:14.78. 500 Yard Freestyle: 1, Clarke, Ellie, ELLS, 6:14.11. 2, Frank, Lillian, ELLS, 6:29.79. 3, Hammer, Katie J, ELLS, 6:42.09. 4, Sossong, Brooke, OT, 7:26.15. 5, Trefts, Libby, OT, 7:41.79. 6, Talcove, Hannah, OT, 8:30.27. 200 Yard Freestyle Relay: 1, Old Town ‘A’ (Blackie, Archer, Ketch, Ketch), 1:51.07. 2, Ellsworth ‘A’ (Barry, Frank, Hammer, Clarke, Ellie H 17), 1:51.31. 3, Old Town ‘B’ (Trefts, McPhee, Saucier, Diaz), 2:09.03. 4, Ellsworth High School ‘B’ (Moseley, Hanson, Atwater, Smith), 2:19.55. 100 Yard Backstroke: 1, Mazgaj, Abby, ELLS, 1:17.02. 2, Moseley, Kristen, ELLS, 1:18.91. 3, Kenny, Mikaela, OT, 1:20.74. 4, Stevens, Sydney, ELLS, 1:22.50. 5, McPhee, Elle, OT, 1:24.16. 6, Trefts, Izzy, OT, 1:28.50. 100 Yard Breaststroke: 1, Hanson, Lilja, ELLS, 1:18.81. 2, Ketch, Emily, OT, 1:20.54. 3, Blackie, Teagan, OT, 1:21.25. 4, Nelson, Miriam L, ELLS, 1:27.82. 5, Hammer, Katie J, ELLS, 1:32.83. 400 Yard Freestyle Relay: 1, Ellsworth ‘A’ (Frank, Mazgaj, MacPherson, Nelson), 4:20.41. 2, Old Town ‘A’ (Kenny, Trefts, McPhee, Saucier), 5:02.36. 3, Old Town ‘B’ (Trefts, Sossong, Talcove, Becker), 5:37.79. Ellsworth boys 105. Old Town 48. 200 Yard Medley Relay: 1, Ellsworth ‘A’ (Markosian, Partridge, Hill, Scheff), 1:47.87. 2, Old Town ‘A’ (Stoyell, Larsen, Rutherford, Chapman), 1:56.23. 3, Old Town ‘B’ (Engstrom, D’Angelo, Regan, Roderick), 2:11.81. 4, Ellsworth ‘B’ (Nelson, Fendl, Ulichny, Farley), 2:14.08. 200 Yard Freestyle: 1, Holmes, Camden M, ELLS, 1:53.04. 2, Fendl, Lucas, ELLS, 2:15.38. 200 Yard IM: 1, Pelletier, Sam, ELLS, 2:06.08. 2, Markosian, Beckett, ELLS, 2:24.98. 3, Larsen, Jack, OT, 2:34.54. 50 Yard Freestyle: 1, Hill, Sean, ELLS, 23.86. 2, Stoyell, Jeremy, OT, 25.43. 3, Clark, Hunter J, ELLS, 26.80. 4, Ulichny, Ryan W, ELLS, 26.85. 5, 1-5-5 Regan, Adam, OT, 27.77. 6, Roderick, Davey, OT, 30.73. 100 Yard Butterfly: 1, Pelletier, Sam J, ELLS, 58.43. 2, Rutherford, Colin, OT, 1:00.31. 3, Stoyell, Jeremy, OT, 1:01.60. 4, Partridge, Nick, ELLS, 1:01.64. 100 Yard Freestyle: 1, Hill, Sean, ELLS, 51.44. 2, Scheff, Henry, ELLS, 52.52. 3, Chapman, Max, OT, 57.94. 4, Ulichny, Ryan W, ELLS, 1:01.26. 5, Regan, Adam, OT, 1:01.67. 6, Chapman, Alex, OT, 1:01.83. 500 Yard Freestyle: 1, Nelson, Calvin, ELLS, 6:03.15. 2, Clark, Hunter, ELLS, 6:54.46. 3, Engstrom, Garrett, OT, 7:01.77. 200 Yard Freestyle Relay: 1, Ellsworth ‘A’ (Hill, Nelson, Scheff, Pelletier), 1:38.94. 2, Ellsworth ‘B’ (Clark, Ulichny, Mazgaj, Holmes), 1:47.14. 100 Yard Backstroke: 1, Rutherford, Colin, OT, 58.21. 2, Holmes, Camden, ELLS, 58.47. 3, Markosian, Beckett, ELLS, 1:03.82. 4, Partridge, Nick T, ELLS, 1:06.45. 5, Chapman, Max, OT, 1:13.17. 6, Roderick, Davey, OT, 1:22.32. 100 Yard Breaststroke: 1, Scheff, Henry, ELLS, 1:14.47. 2, D’Angelo, Joseph, OT, 1:14.61. 3, Larsen, Jack, OT, 1:15.29. 4, Chapman, Alex, OT, 1:18.48. 5, Fendl, Lucas, ELLS, 1:23.35. 6, Mazgaj, Ben, ELLS, 1:26.98. 400 Yard Freestyle Relay: 1, Ellsworth ‘A’ (Pelletier, Partridge, Markosian, Holmes), 3:47.62. 2, Old Town ‘A’ (Engstrom, Rutherford, Stoyell, Chapman), 4:03.80.